actually the ONLY person, that can change your life. long, healthy, and purposeful life. Are you ready for the introduction? No, it isn't Dr. Deepak Chopra. But it is some ONE you know. Continue reading to ﬁnd out who it is! I want to introduce you to the ONE power that can make all the difference in your life. I first discovered it many years ago, through my friend, Dr. Deepak Chopra. I've used it every day since, and am still amazed and thrilled by all of the things it has done for me. Dr. Deepak Chopra has a unique understanding of the powerful source you seek. And, he is willing to share it with you on this amazing collection of remarkable recordings that represent the "pearls" of his insight and experience. Whether you’re a devoted Deepak fan or a rookie, I believe you will be absolutely awestruck by this exciting offer: The Ultimate Deepak Chopra Collection :The Healing Power of ONE. Exclusively assembled by Nightingale-Conant, this unprecedented program, created in response to overwhelming demand, delivers the most comprehensive collection of highlights from Dr. Deepak Chopra’s many inspired live and studio recordings. In the library collection, Deepak’s amazing "holistic" wisdom and knowledge is conveyed in a manner that shoots straight through the mind, to the heart and soul. By explaining his ideas in everyday language and logic, Deepak has introduced thousands of people to the ONE power that continues to transform and transcend lives on a daily basis. In no uncertain terms, Deepak Chopra, hailed as the "pioneer in the medicine of the future," directs you to the ONE source of well-being on all levels - physical, emotional, spiritual. The ONE and ONLY Is YOU! That's right! The ONE person who possesses the power to make all the things happen that I just told you about is YOU! Not a guru. Not a mystical presence from a foreign land. Not a charismatic leader. YOU! Once you learn to tap into the boundless energy that exists inside you, unlimited possibilities and potential in the infinite universe are yours to experience and enjoy. How incredibly exciting! But to do that, you have to access the power. And to gain access to that power, you just have to do ONE thing. What is that ONE thing and how do you get to it? That's where Deepak Chopra comes in. The pursuit of balance, ONEness in the Ayurvedic sense, is a multilevel, multifaceted experience that is designed to last a lifetime. The Ultimate Deepak Chopra Collection incorporates the most intense, thought-provoking concepts from all of Dr. Chopra's best-selling Nightingale-Conant programs to shed light on the many dimensions, applications, and sheer joys that are integral in the Ayurvedic process. The Ultimate Deepak Chopra Collection explains how the power in you is supported, guided, and connected to a kind, loving universe that is unfolding as it should. It operates as a valuable reference guide as you become familiar with the principles of whole-body healing and begin manifesting its stunning benefits. As you grow, don't be surprised to discover that the lessons and significance of the program are evolving with you. becoming the ONE with the power? Reverse the aging process. - It's laugh-out-loud funny to discover how easy it is to feel 10, 20, even 30 years younger and live to 120 years or more! Prevent life-threatening illnesses before they take hold. - Create an inner sensitivity to minor disturbances and apply healing techniques before they manifest in serious illness. Instruct your body to remedy serious diseases. - Use the natural chemicals that your body was made to produce to treat ailments like coronary heart disease, diabetes, liver afflictions, asthma, ulcers, cancer, even AIDS. Never suffer from another craving for sweets. - With a couple of quick diet and sensory adjustments, they're gone for good! Say good-bye to that dirty four-letter word - DIET! - Employ eating awareness and realize your ideal weight without effort. Naturally balance your metabolism and energy level. - It's easy with knowledge of herbs and the use of your senses. Throw away those glasses and forget risky surgery! - Find out how you can correct your eyesight with simple, quick exercises. Ditto for hearing aids! Eliminate all types of pain in just 15 minutes. - Discover how you may never need over-the-counter medications or narcotics again! Go for it and get it! - There's nothing wrong with wanting to be rich or successful. Learn to create the reality! Alleviate common illnesses. - Determine balancing techniques to treat colds, allergies, sinus ailments, insomnia, etc. Enjoy more intimate relationships. - That includes being more personal with yourself. Grow by experiencing time alone and using it to forge deeper bonds with others. Erase depression and anxiety. - You can take control without drugs. Get more satisfaction from your relationships. - When you see how really worthwhile you are, you'll recognize it in other people. Count on your intuition. - When you're in balance, life is effortless and you know how to handle situations that used to baffle you. Improve your memory in a few easy steps. - You don't have to surrender anything to age! You can get sharper! Live a more spontaneous, exuberant life rooted in the present. - Develop techniques that eliminate the burden of the past and the worry of the future. Remove all negative emotions. - Put doubt, resentment, guilt, rejection, and failure to rest. Toss off resentments and heal yourself of all past hurts. You don't even have to suffer from "bad moods" if you don't want to. Cast off troublesome addictions. - Discover how pleasure can displace the worst compulsions. Understand stress. - Use practical advice to rid it from your life forever. Know God. - You will have all you need to understand the very nature of being. Feel the presence of ultimate love and potential working through you as this connection strengthens. Connect with your true self. - Come to view who you are in Ayurvedic terms and embrace yourself. Understand life after "death." - What happens after your physical body dies will no longer be a mystery. Comprehend the origin of life. - Big answers to big questions will suddenly materialize. Project a positive, peaceful presence. - Learn how to obtain new peace of mind that can help transform the world. Do less, get more. - Apply meditative and physical exercises for higher levels of awareness. The more you practice, the less you'll have to do to get what you want. Believe in magic. Learn to open to an existence where limitations and restrictions do not exist. Where joy, happiness, and fulfillment are available at any moment. And believe it or not, that's JUST THE BEGINNING! - There's so much more to be gained from this phenomenal program. That's why I am encouraging you to order the amazing The Ultimate Deepak Chopra Collection! The Ultimate Deepak Chopra Collection is a massive, meticulously arranged, and artfully compiled library designed to present fresh ideas and concepts that appeal to Chopra old-timers and beginners alike. Composed of 10 information-packed volumes with 20 CDs, this collection represents Dr. Deepak Chopra's greatest works to date. I consider Deepak a personal friend. In fact, Nightingale-Conant has offered many of his most popular programs exclusively. I have long admired Deepak's gifted articulations regarding the extraordinary mysteries of healing and his ability to present new and old healing techniques to you - the ONE who holds the power to use them. 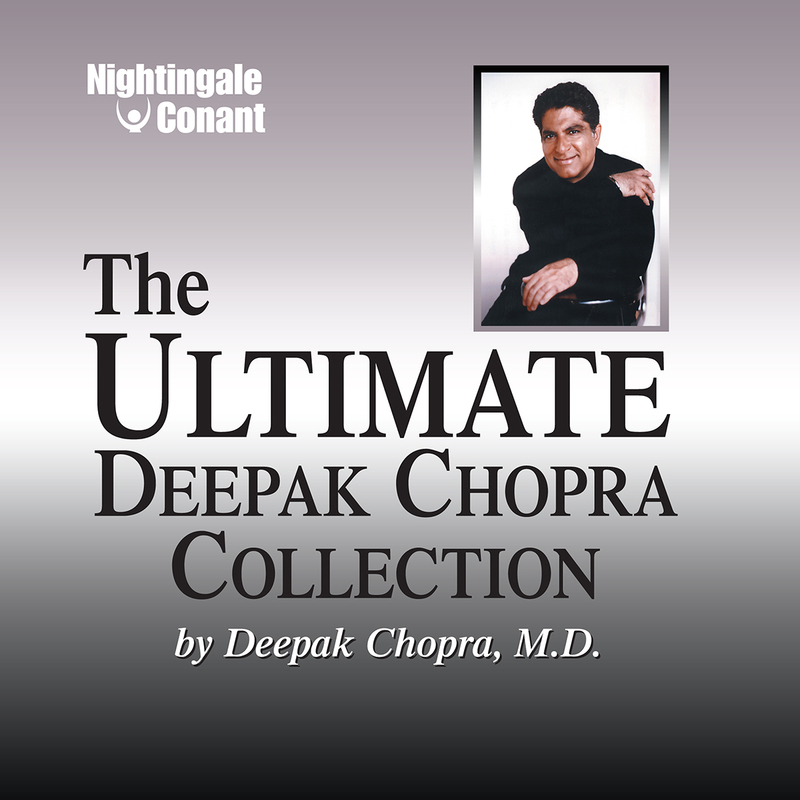 Compiling The Ultimate Deepak Chopra Collection was a labor of love for us here at Nightingale-Conant. Because I feel the content and breadth of Dr. Chopra's work is such a vital portal for the transformation of lives, I wanted to make sure nothing critical was left out of his many masterpieces. At the same time, a concentrated effort was made to ensure relevancy and consistency. Quantum physics and metaphysics - consider an informative explanation of your existence relative to the dynamics and levels of these principles. Doshas - delve into a comprehensive examination of the use and awareness of mind/body connections - Vata, Pitta, and Kapha - that are critical to Ayurvedic healing. Thought - gain insight regarding the differing types, how they originate and what they can do for you. Coherence - find personal and universal harmony, and learn how it is achieved. Senses - discover how sight, sound, smell, taste, and touch can heal you, incorporating the concept of "entrainment." Soul and Spirit - learn about their many layers, insights, cycles, and laws, and how they manifest themselves in your life. SynchroDestiny - look at the phenomenon of "coincidence" and what it really is. Balance - find out about the natural state of being and how to maintain it. Diet - explore how to change your ideas about food and how to use certain nutritional supplements to protect and restore health. Power - listen to revelations that consistently prove the existence of an infinite resource that is in your command. Energy, Information, and Intellect - learn how focusing attention can create the world you want. Reality - explore a compelling theory that you are the force that creates reality. Medicine - discover several methods for accessing your inner "pharmacy." Intent and Desire - focus on what you want and understand - it can be yours! Higher Self - examine the many levels of self-awareness that add to your existence. Meditation - participate as numerous silent and chanting exercises are demonstrated. Concept of Time - learn that time travel is possible! You really can turn back the clock. I have little doubt that once you have listened to The Ultimate Deepak Chopra Collection and start applying the techniques that are suggested, you'll begin seeing changes in your life. More importantly, you'll start feeling the POWER. I am convinced this is ONE program you will definitely want to make part of your permanent spiritual library. But don't take my word for it. Find out for yourself. Are you ready to become better acquainted with the ONE person who can make anything possible? Don't waste another second limited by old perceptions and ideas. Click on the link below, then smile and take a good look in the mirror. You'll never see yourself the same way again! I want to become better acquainted with the ONE power that can transform my life! for the special price below. I can select one of two ways of ordering.